Now that Kelly Clarkson has called Clive Davis a liar and a bully, and revealed that she felt violated by his account of their relationship in his autobiography The Soundtrack of My Life, I thought it would be interesting to get the perspective of a man who worked under Clive. Don Silver came to New York in his early 20s with stars in his eyes, a song on his lips and a dream in his heart. Using the chutzpah that only the young man can muster, he talked his way into becoming an A&R man, scouring the country looking for great new acts that Clive could turn into superstars. 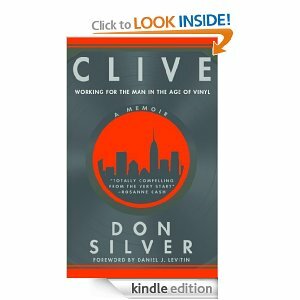 And now he’s written a memoir about it: Clive: Working for the Man in the Age of Vinyl. DAVID HENRY STERRY: What did you think of Kelly Clarkson calling Clive Davis a liar and a bully, that she felt violated by his book, that he belittled her and tried to sabotage her record? DON SILVER: I take her comments at face value. She felt the way she felt during artistic disputes with Clive, whose job is to push artists to use material that will reach the widest audience. That Clive issued a statement saying essentially that her memories and feelings are wrong and that his book was fact checked by five witnesses is astonishing to me. Why be defensive? It actually makes the point that he is always trying to deny, which is that unless they want to be as rich and famous as possible, he often has a different bottom line than the artists he works with. DHS: Did you observe Clive trying to change other artists to his own end? DS: He was always looking for hit songs for artists that didn’t write their own. Once, he took what I thought was a pretty lame song I’d pitched for Manilow, “Whatever It Is,” and had Aretha Franklin record it. I thought to myself, really? You’re going to steal the Queen of Soul from her illustrious career with Ahmet Ertegun at Atlantic Records and turn her into a middle of the road singer? After the Band broke up, Clive pressed us for covers for Rick Danko, but this time I couldn’t bring myself to send anything in. While I was there he signed the Dead, whom I loved, and put pressure on them to be commercial, which resulted in two of their least satisfying albums, Shakedown Street and Go To Heaven. DHS: So, what made you want to go into the ridiculous music business? DS: I was a kid from the Philly who grew up on great music. It was the most important thing in life to me and I wanted as an adult to immerse myself in it. I was in a band, thought I had a really good ear, and I read–and re-read Clive Davis’s autobiography. I mean, I studied that book. I thought he was, based on that book, something of a god among men. DHS: How did you get a job at Arista? DS: I sent in my resume and then did what my dad told me every twenty-two year old who was driven did: I kept calling Clive’s office until one day, his secretary Rose called me back and said, “Be here tomorrow at 5. Clive will see you then.” I had enough of that innocent, ballsy belief in myself that used to (circa 1980) open doors–even for a kid like me. DHS: What was it like meeting Clive for the first time? DS: It was like having an audience with the great and wonderful OZ: I was ushered into his gigantic office, took a seat, then just listened while he pontificated about the music business. Then he started sampling music and asking me my opinion. I thought I’d died and gone to heaven. DHS: What was your job there? DS: I was a junior A&R guy, so my job was to listen to unsolicited tapes, scout new talent at clubs, and pitch songs to Clive for artists on the label. My office was what had once been a supply closet, but I had a seemingly limitless expense account. I was living the dream! Until, of course, I wasn’t. DS: I grew-up. Fast. I went through happens to a lot of young people who go into a business believing they’re going to be working with art, but when they get there, they find out that art and commerce don’t really mix. On top of that, I had hugely unrealistic expectations about what kind of a boss, what kind of a person, Clive would be: I thought he’d teach me how to do my job with a certain kind of integrity, a certain kind of style and grace. I expected him to be a sort of mentor figure. But I realized, pretty quickly, that he wasn’t someone I wanted to emulate. At all. DS: I landed at Arista when he was in his golden days, building the company into a major label. He’d begun to master the manufacturing of the empty pop star. He wasn’t interested in making great music or cultivating artists–he was interested in selling hits. I was a guy who wanted to be around the kind of amazing music I grew up listening to, and here I was, working for a man who seemed determined to eliminate that soul–that heart–at all costs. DHS: Don’t you think that’s a bit of a harsh assessment? DS: Actually, I don’t. I worked for the guy who was able to host a party on the same night his “dear friend” and protege–Whitney Houston–died. And not only did she die that day, she died in the same hotel where he was throwing his party. That qualifies as pretty heartless in my book. DHS: What happened after you left Arista? DS: I left after just a couple of years, totally disillusioned, but not defeated: I started my own production company with my friend who’d been Clive’s former assistant. I wound up–of all things–becoming a writer. I guess, in the end, the artist in me prevailed. His memoir about working with Clive Davis is available now.